Summer is one of the most fun times of the year. With the warmer temperatures, you can finally enjoy all of those outdoor activities that your family loves. But, while you’re fishing on the boat, building sand castles at the beach or relaxing by the pool don’t forget about the potential dangers that the sun brings. Prolonged exposure to the sun can be very problematic. Most know that sunblock is a must in the summer month, but don’t forget to also protect your eyes. Polarized UV sunglasses are a must. Why are sunglasses so important? For starters, sunglasses help to prevent any eye problems. Our eyes are very sensitive. Prolonged sun exposure can even lead to blindness if not treated correctly. The reason is simple, there are UVB and UVA rays that can easily damage your eyes. 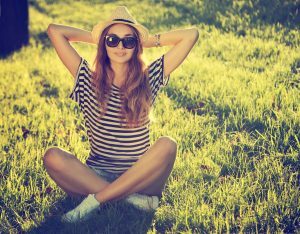 Ultraviolet rays are very powerful, and the last thing you want is your summer fun leading to future eye problems. Thankfully, sunglasses can help you avoid any problems like that. You get to have full protection against the ultraviolet rays. The polarized sunglasses in particular are great because they can easily reduce glare. If you spend a lot of time in/on the water, then this will help you quite a lot. If you have wrap-around lenses, those end up blocking the glare and light from both the sides and back as well. What type of eye problems can you prevent with sunglasses? The first one would be pterygium. This is a growth of the eyeball. It’s not exactly problematic for your vision, however it can be very annoying and downright painful most of the time. You will need steroids, eye drops or surgery to deal with this. Then you have macular degeneration. This is a condition where some of the retina will deteriorate. As a result, your vision will be impaired. Macular degeneration is more serious, as in time it can lead to blindness and similar issues. UV rays can speed up the process, so wearing sunglasses will help you a lot in this regard. Glaucoma and cataracts can also appear from prolonged exposure to the sun. These can also lead to serious eye problems or even blindness in the long term. Using sunglasses will help you quite a lot as you try to prevent these problems. As you can see, wearing sunglasses is more than just a fad. Used adequately, sunglasses will help prevent any eye problems. You also get to protect your eyes from the elements. Dust, dirt and other compounds can easily accumulate around your eyes. But if you have eye protection such as sunglasses, they will help keep your eyes safe. That will help you a lot, so try to take that into consideration. Schedule an appointment today at Eye Care Associates to browse our selection of sunglasses and figure out which are right for you. One thing is certain, you do need sunglasses if you want to keep your eyes safe during the summer!